This is a top down shooter with horde survival gameplay. The brain slurping aliens are only vulnerable to bullets. Using your flashlight, environmental light, and special powers helps the player to take care of the unwanted pink guests. It creates a unique atmospheric setting and addicting, straightforward gameplay. Your name is Jerry, you're a bald, no-nonsense kind of guy equipped with a flashlight and you know how to handle a weapon. You somehow managed to survive the invasion of a merciless alien species, the kind that feeds on human brain. Things look bad when you wander the city, looking for gear and weapons to survive, as pink light emitting aliens try to corner you. You realize there is only one thing left to do: set a new high score and die like a badass. 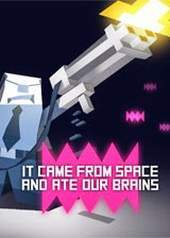 It features: unique pink alien species; play with up to 4 friends in co-op; different weapons, which are all upgradeable; 6 levels set in unique atmospheres; controller support.